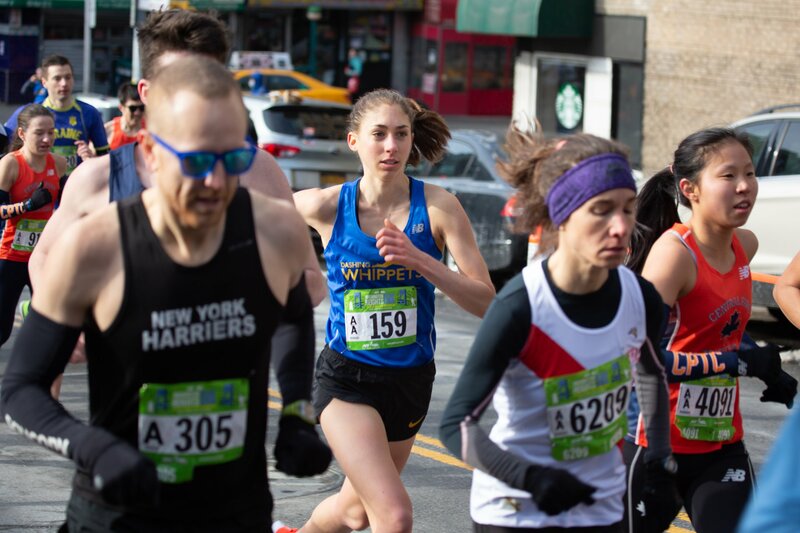 The Washington Heights 5k was only my second race as a Whippet and my first race since the Staten Island Half. As a competitive person who loves to race, this one was a long time coming. I was more than excited to toe the line for the first time in 2019 and represent the Whippets in the first points race of the year! I arrived at the Armory with plenty of time to settle in before I began my warm up. Getting to the race site early allows me to take in my surroundings and scope out the environment. For some reason, seeing the happy (or stressed out, in some cases) faces of other runners ready to go (or not) calms my nerves. I sat down for a while in the heated hallway before heading outside to meet my warmup partner. Steve and I began our 2 mile warm-up around 8:15 where we ran into a few others including Matt Wong, who was kind enough to let us stash our things in his car. I debated on wearing gloves and/or arm sleeves, but decided I wasn’t going to freeze to death if I went without them. Every ounce counts, right? A few of us headed over to the corrals together, where I was thankfully encouraged by my fellow Whippets to start in the AA corral even though I didn’t think I belonged up there. Those women looked really fast. Just before they locked us in, I was able to get in a few strides about ten minutes out from race time. I find that these really help my start as I am not very swift out of the gate. Before I knew it, they lined us up and off we went! I didn’t really have a goal going into this race. Throughout my college running career I never raced (seriously) on the roads, so this seemed like a relatively new experience. It’s hard to compare fitness when I’m focused on training for two very different race distances (3k-10k in college, marathon currently). My main objective was to attack this course as best I could. The first mile was a bit of a blur. Adrenaline carried me through the first hill, as I barely felt an incline. My lungs began to burn almost immediately, but I’ve raced enough to know that I would settle in and the fast pace would begin to feel easier (well, less hard). I heard my name a couple of times from some familiar voices on my way to the first mile marker, which gave me a nice little boost. Mile 1 came at around 5:50, according to my Garmin. Once we hit the downhill at the beginning of the second mile, I tried to let my legs carry me down as much as possible. The roads were slick and the salt didn’t help maintain traction, but I managed to pass a few people before getting to the bottom. This is where I was able to control my breathing and open up my stride. I really did feel like I was flying. After making the turn I knew I was in for quite a climb, so I intended to focus on closing the gap with the people in front of me. Instead I thought about how delighted I was that the sun was out. Whatever was going on in my brain at the time must have worked, because I made it to the top feeling strong. I crossed mile 2 in 5:40. Then came the final mile. I could feel the lactic acid really start to set in, but I still had the energy to keep digging. My “kick” began with about half a mile to go because speed is not exactly my strong suit. The slight downhill helped. I looked up to see the deceiving 3rd mile marker and again at the finish line clock. They weren’t as close together as I thought they would be, but I wasn’t going to let myself slow down. The goal at this point was to hold my ground as best as I could against those that are able to really fly to the finish line (if this is you, I am jealous). Eventually I made it to the mat and was happy to see that I came within a few seconds of my best 5k mark in college cross country (official time: 17:40). 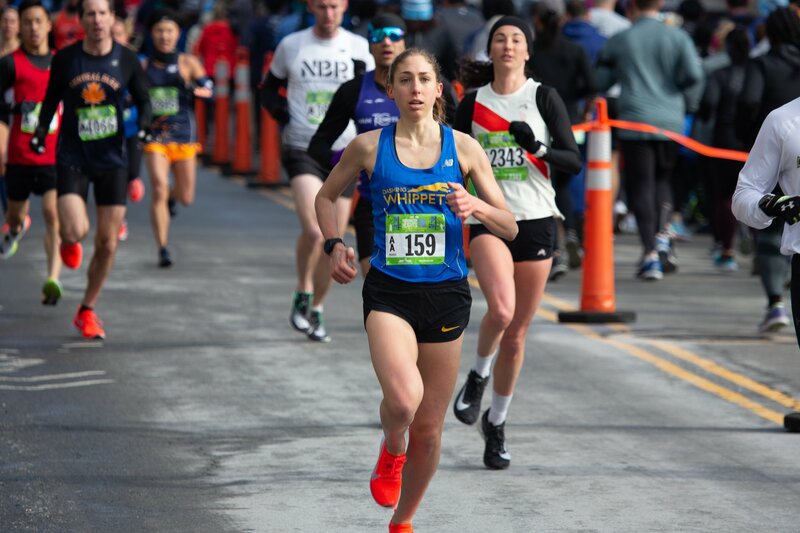 I was shocked to hear one of the officials mutter “fifth woman, sixth woman, seventh woman” while frantically scribbling some bib numbers on a clipboard as we piled into the finish chute. Top ten wasn’t something I set out to accomplish, but it was pretty cool to find out I had made the leaderboard! I walked towards the exit excited to find out how everyone else did. I was reunited with a bunch of Whippets at the 170th St intersection as the streets began to fill with finishers. While running can be very individual, having a team to share these experiences with afterwards is one of the best parts. We all ran the same distance in the same place on the same day, but everyone has a unique perspective. After a few minutes of sharing our personal victories, a group of us made our way back to the parking garage to retrieve our things before beginning a long cool down. I was glad there were others that made plans to get their long runs in that day. The wonderful combination of endorphins and good company made the 14 miles post-race rather pleasant. I felt surprisingly fresh and could have gone a bit longer, but I figured capping the day at 19 miles was a good decision. I’m very happy with my performance overall. The thrill of competition and the satisfaction I get from leaving everything out on the course makes all those tough workouts in training worth it. The team aspect adds an extra layer of motivation and camaraderie that intensifies my love for the sport. Thank you to everyone that came to cheer, race, and take pictures! Becoming a Whippet is one of the best things that has happened to me since moving to New York 7 months ago. I wasn’t sure what my athletic pursuits would look like as a post-collegiate, but I’ve had more fun putting in the miles than I could have imagined. All of this is because I get to run with some pretty wonderful people week after week. So again, thanks to everyone for the continued support. I can’t wait to represent the Whippets again in a few weeks!